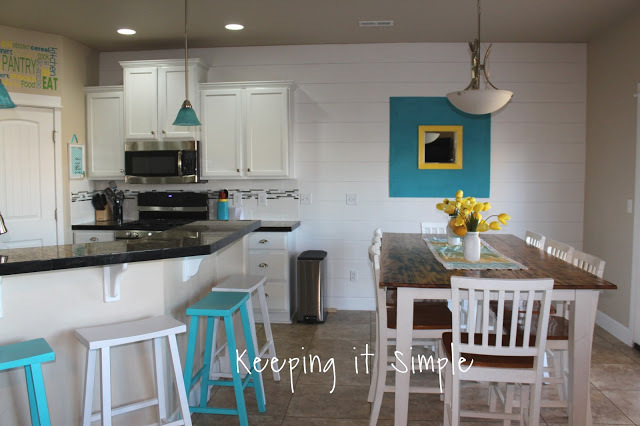 When we moved into our house about 2 years ago there were things that I knew immediately I wanted to do it, to change. One of my favorite things about my house is the grand entrance. We have a two story entry way that is long and big and spacious. I just love it! 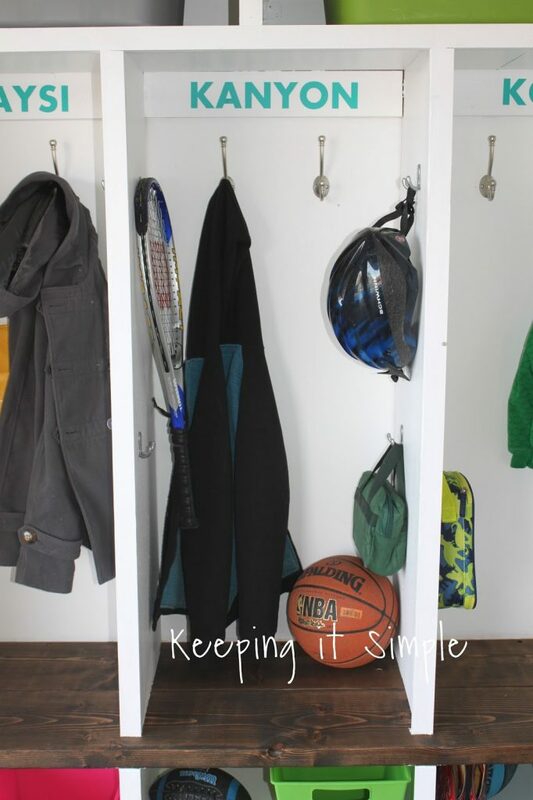 One thing that I don’t love about my house is there is no coat closet, hall closet or a mud room. 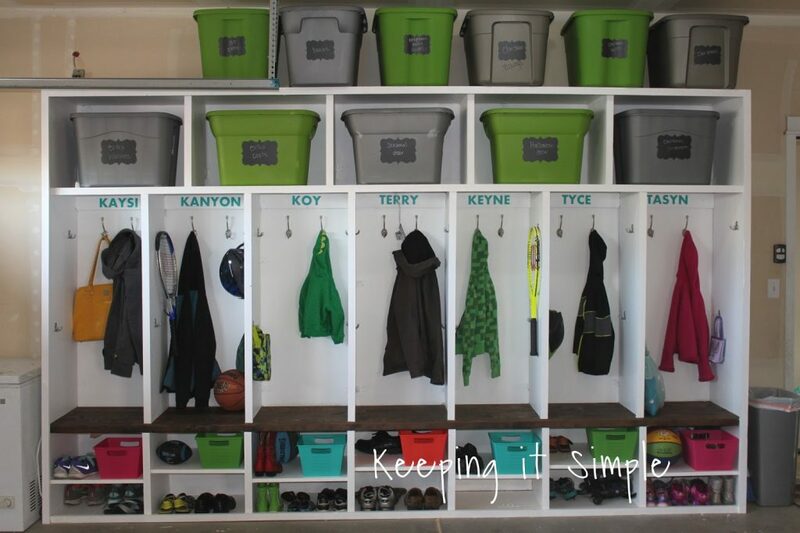 So when the kids get home from school, the entry way becomes the “mud room” and their shoes, coats and back packs go on the ground. It drives me crazy! I want my entry way to be clean and uncluttered. 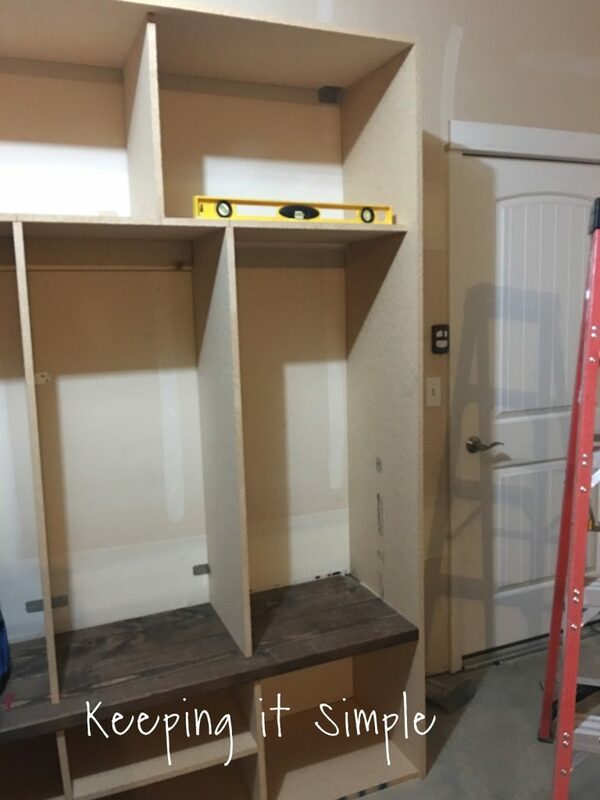 Since we moved in I have been wanting to make some kind of mud room in our garage for their coats and shoes and other stuff. Well this weekend, we finally did it! 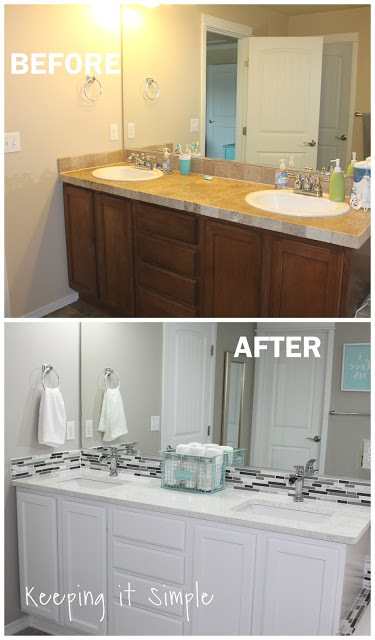 I am so excited about how it turned out and how much of our stuff we can put in it. It’s massive, it’s 12 feet wide and just under 8 feet tall. 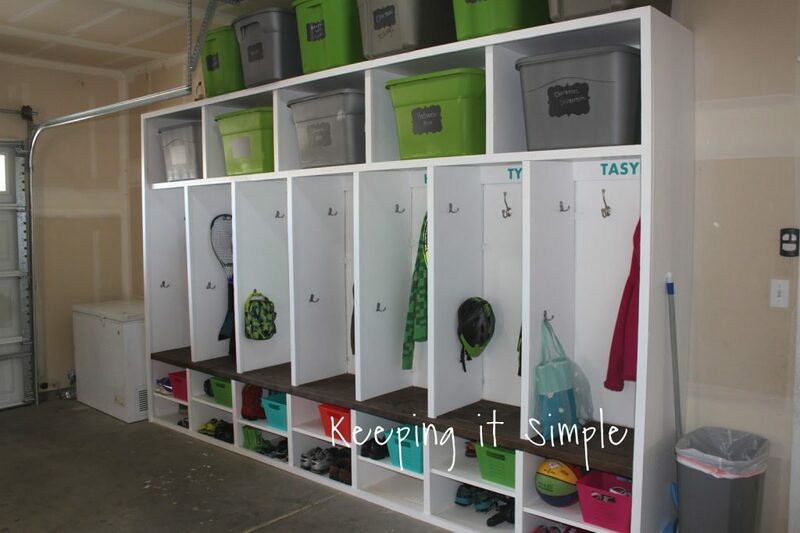 My favorite part is that now there is a place for everyone’s shoes and coats and back packs in these garage mudroom lockers. This is what our garage looked liked about 75% of the time, so we knew that we needed to do something about it! This is how we built it. 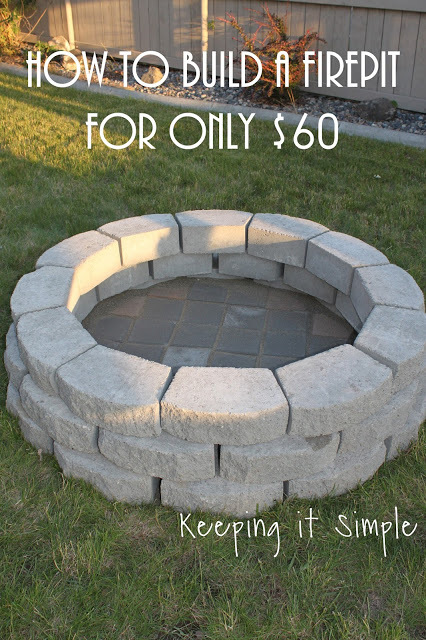 It cost about $500 to make (it would be less if you built a smaller one). The first thing we did was built the bottom part for the shoes. We took a 4×8 feet piece of particle board and cut it with a table saw. We cut three pieces 18″x4 ft for the bottom and using metal plates we screwed them together. 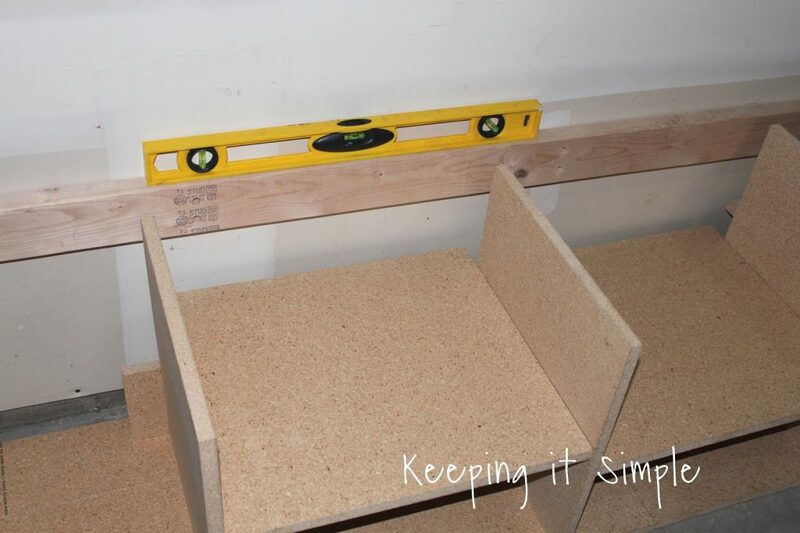 Then we cut the particle board into 6 pieces 18″ high and 16″ wide for the shoe units walls. We then used a nail gun to nail those into the bottom piece, 1 1/2″ nails. 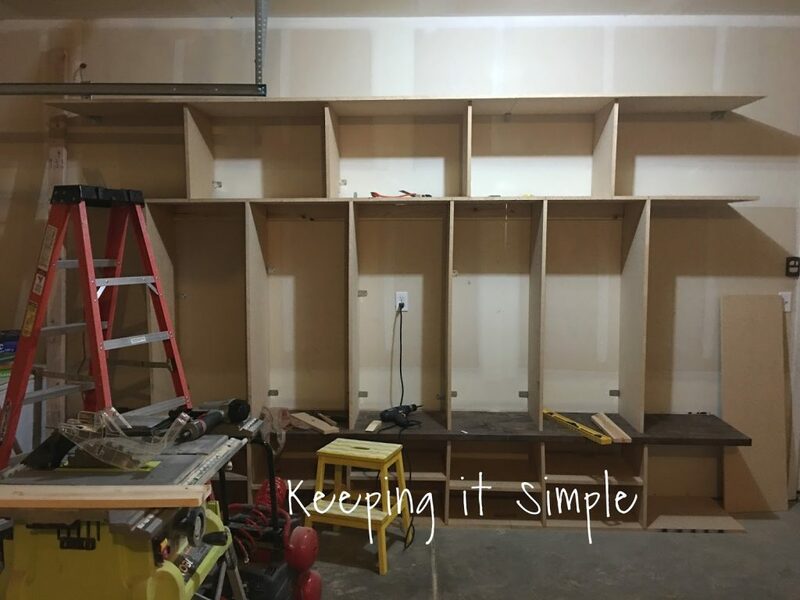 Then with a couple scrap pieces of wood that were 4 feet wide, we nailed it onto the back of the walls (for more support). 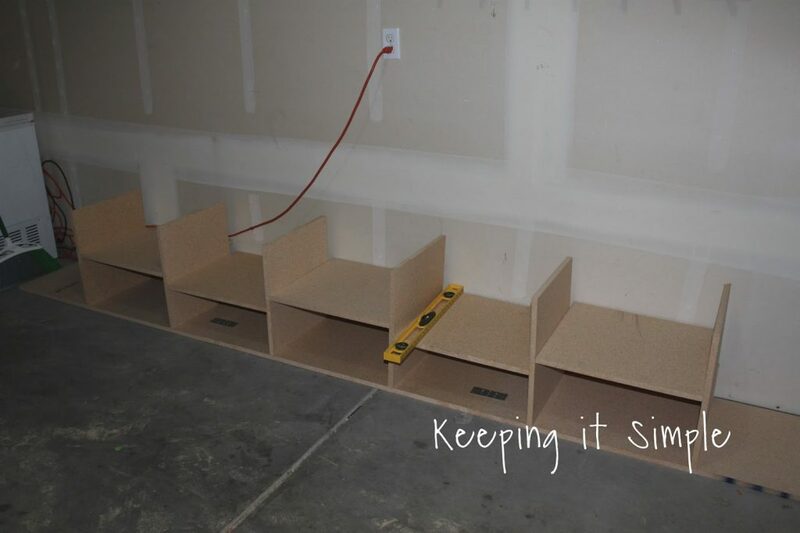 And then lastly we put in the shelves for the shoes. We offset them so we could nail them in from the sides. 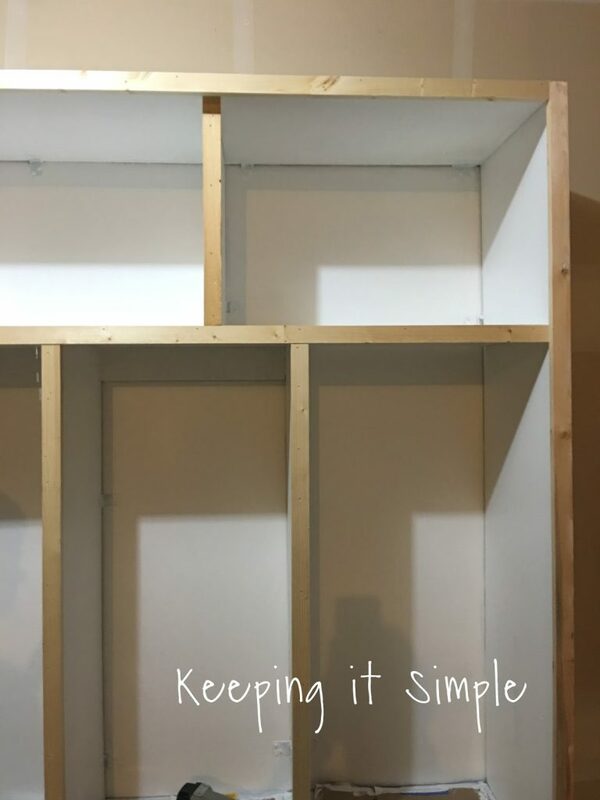 The key with all of the cubbies is to measure lots to make sure you’re right on and to use a level to make sure it’s straight. 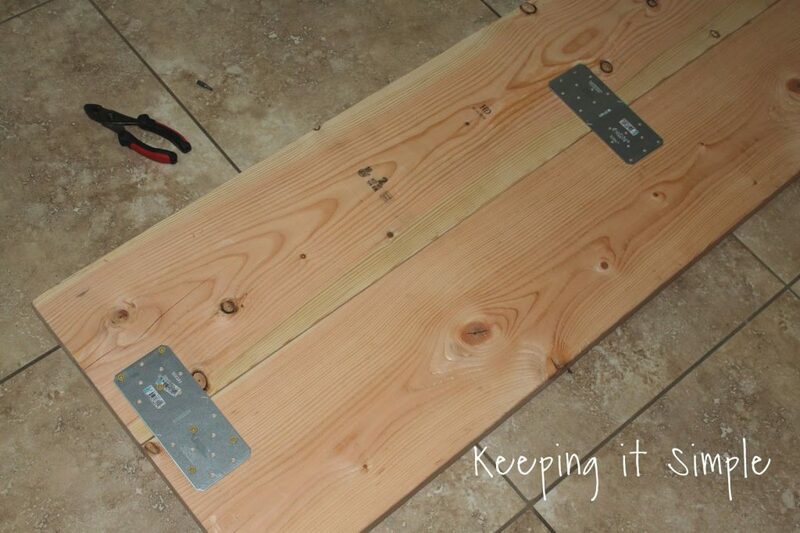 We then took two 2″x10″x12′ pieces of wood and put them together with metals plates. I think altogether we had 6-8 plates keeping it together. We put the bench on top of the shoe part and then screwed the bench to the 2×4 that is screwed into the wall, we did it in 7-8 places. 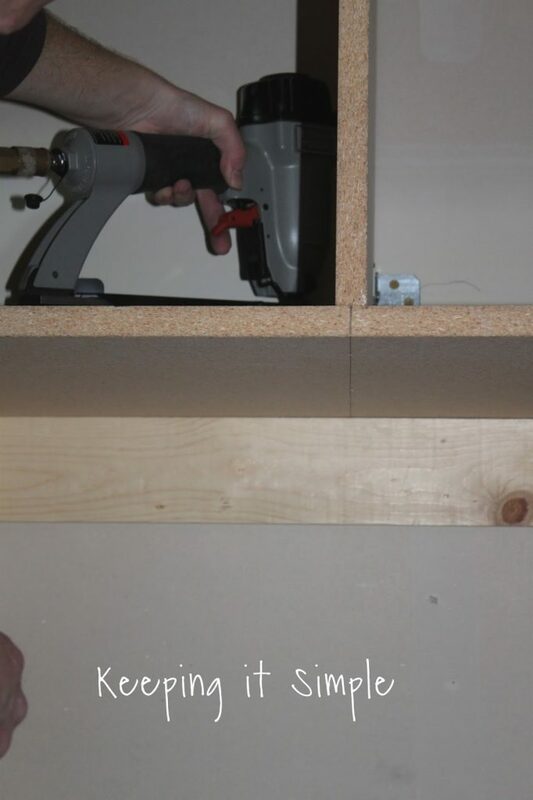 Then using 2 inch nails we nailed the bench into the walls of the shelves. Then I stained it with an espresso stain (and let it dry over night). Next we put up the walls for the cubbies. These were 4 feet tall and 16 inches wide. Using L brackets, we secured them into the wall. We had to use heavy duty dry wall anchors when it didn’t match up with a stud (which was most of the time). Each wall had 4 L brackets, two on each side. Next we put on another shelf. 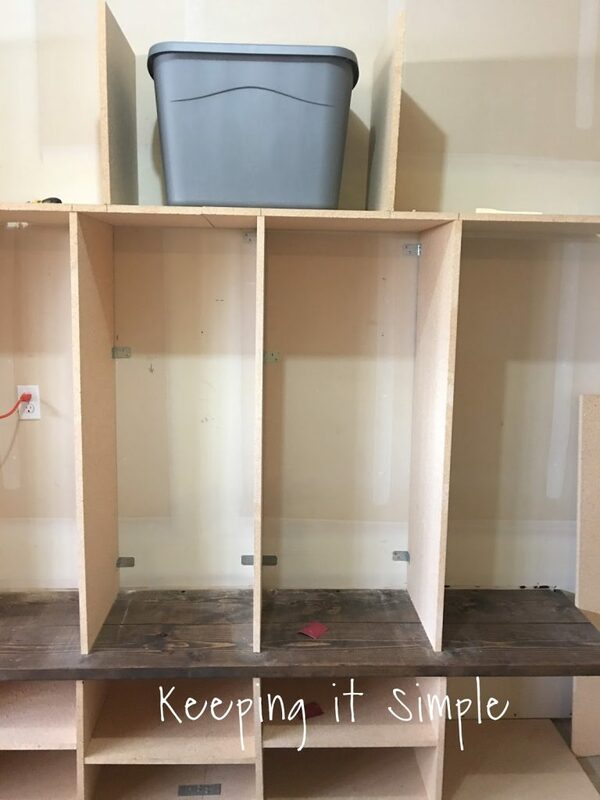 We cut the particle board into 3 pieces that were 4 feet by 16 inches and connected them with metal plates again. Then we nailed them into the cubby walls. Since this is going into our garage, I wanted to make sure that we had a lot of room for storage. So I picked up ones of those $5 totes and used that to make the measurement for the top units. 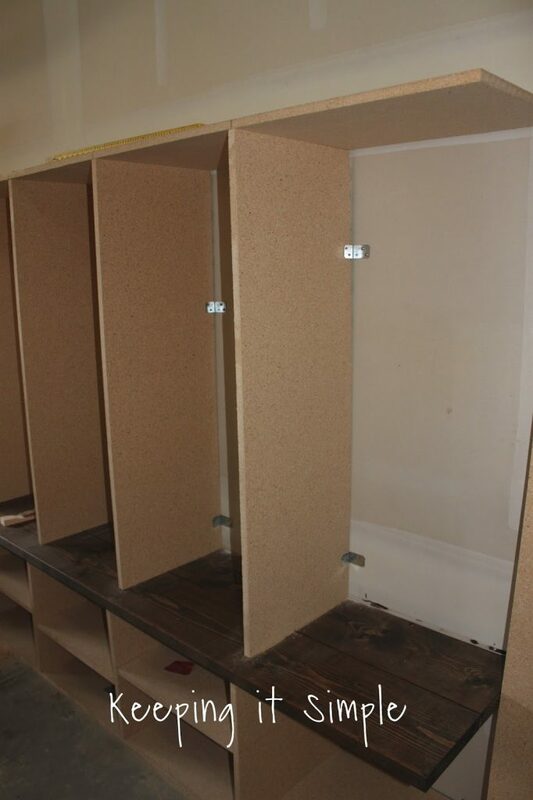 Each of our cubbies for the kids are about 20″ wide but these ones are about 29″ wide so they can fit the totes. 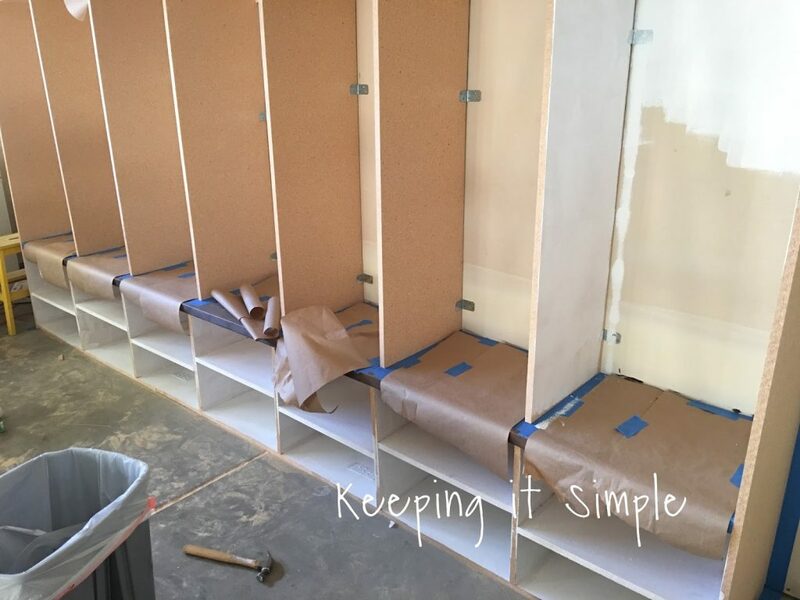 For the walls for these shelves, we cut the particle board into pieces that were 16 inches wide and 19 inches tall. Then we nailed those into the board underneath. We also used L brackets to connect them into the wall. 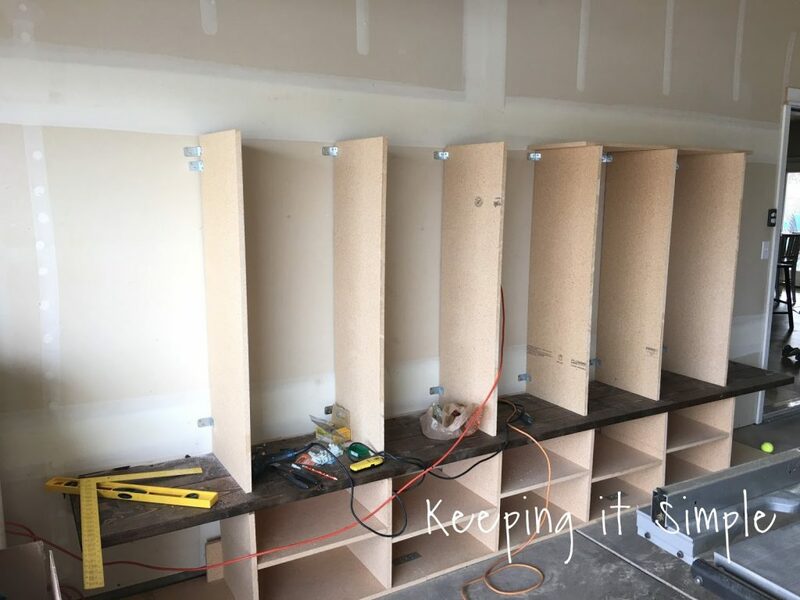 For more support, we added a 1×4 pieces of wood to the back of every cubby and screwed them into the studs of the wall. We cut them individually and then nailed the top shelf into the them and also the side wall into them. We then put the top piece on. 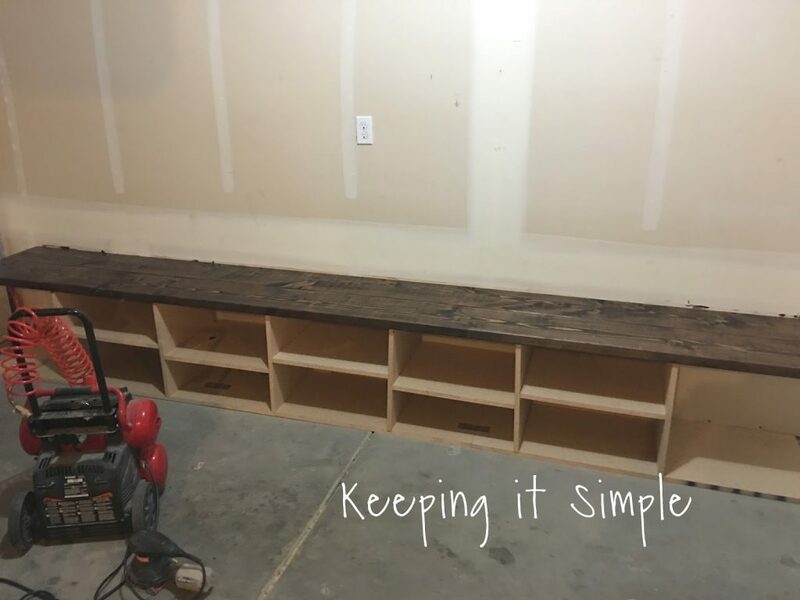 We cut it a little differently, this time it was 18 inches wide (so it would match up with the bottom shelves when we put on the sides) and one piece was 8 feet long and the other one was 4 feet long. And again we used the metal plates to connect them together. We also used some more heavy duty L brackets to secure it to the wall. And then we nailed it into the wall pieces. So here it is all put together (before the sides). It’s not a difficult project, it just takes a lot of time with measuring and cutting it. Now it’s time for the sides. We wanted the sides to be a solid piece, so we cut it 18″ by just under 8 feet. 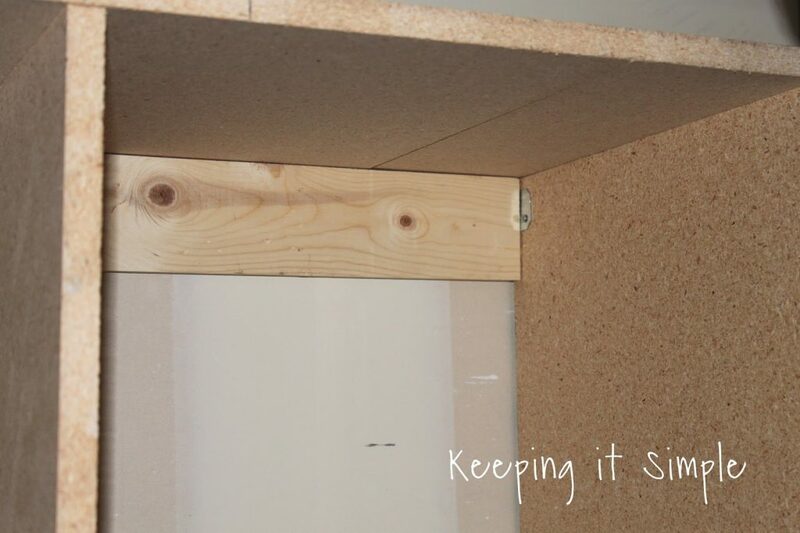 We nailed it into the other pieces of wood and then we also used some L brackets to secure it to the wall. 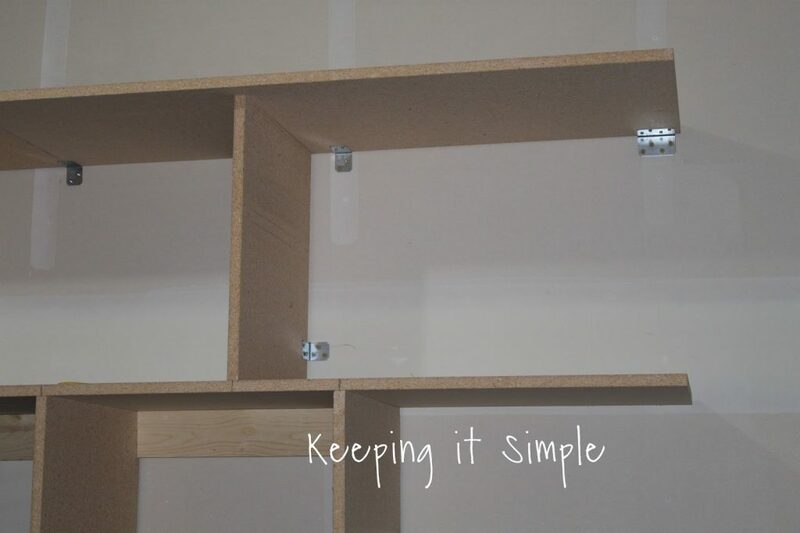 Then we put in the two shelves for the shoes and the two pieces of wood that go at the top of the cubbies. Now time for the painting. I taped everything off and then painted it all white. It took a lot of time and paint, I used about 2 gallons of white paint (that had a primer in it). Here it is all painted. Now for the molding to give it a nice, finished looked. 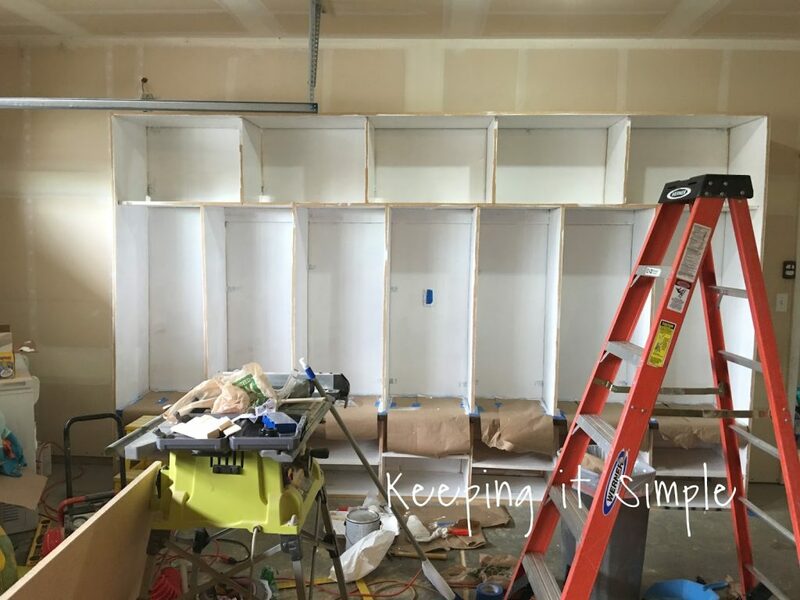 We just took a 1″x 2″x 8′ and nailed it onto the particle board. And then I painted it all again, it’s amazing the different it makes with that molding in, it just gives it a nice look :). And finally I added some awesome hooks, added our names with vinyl, got a few baskets for things and filled it up! I love everything about it! It turned out better than we expected! 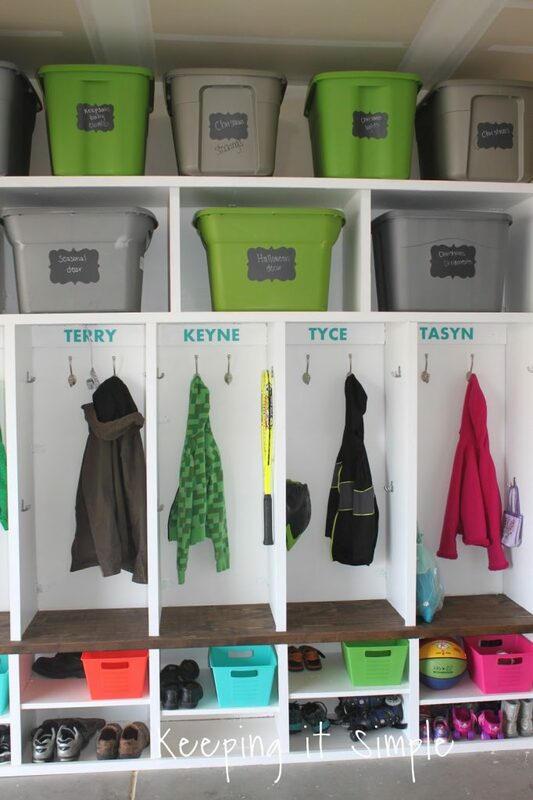 I love that I can tell my kids to put their things away in their cubby and they listen to me! 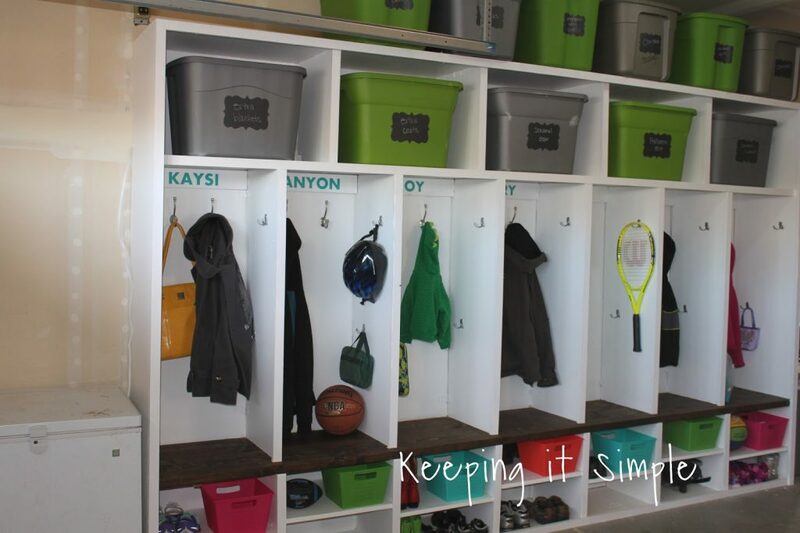 There is a place for everything, they can put their coats in there, their shoes, backpacks, sports equipment and more! The little baskets are for those little things that will fit in there, like hats and gloves or little balls. I could fit lots of shoes in there too, since it’s 18″ deep my little girl has two rows of shoes in hers (she has a lot of shoes). My favorite part about the whole thing has to be the space for the totes. I can finally have my seasonal/holiday decorations organized and up high so they aren’t in the way. So far I have 11 totes on there but I might add one or two :). I added some chalk board vinyl onto them so I can stay organized and just wrote on them with a chalk pen. That is AWESOME and beautiful and so functional! Awesome job! Hope to be able to copy it someday when I have the space!!! Love it! 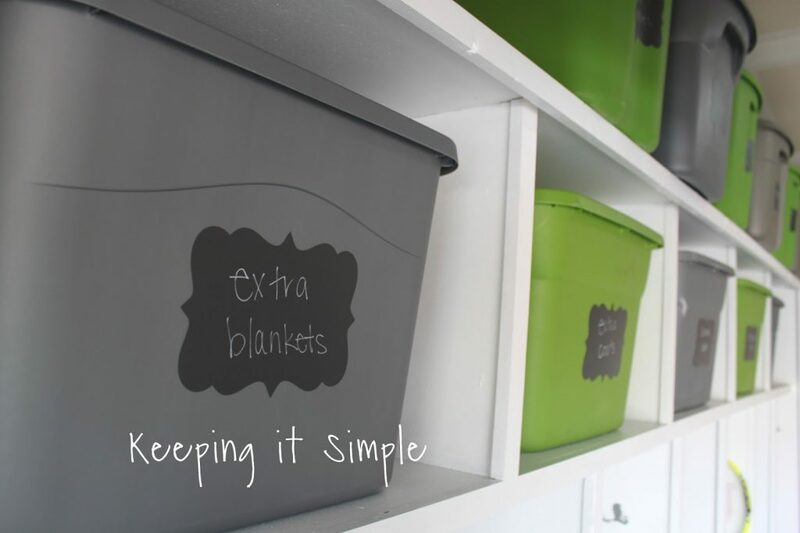 It is perfect to keep everything organized. 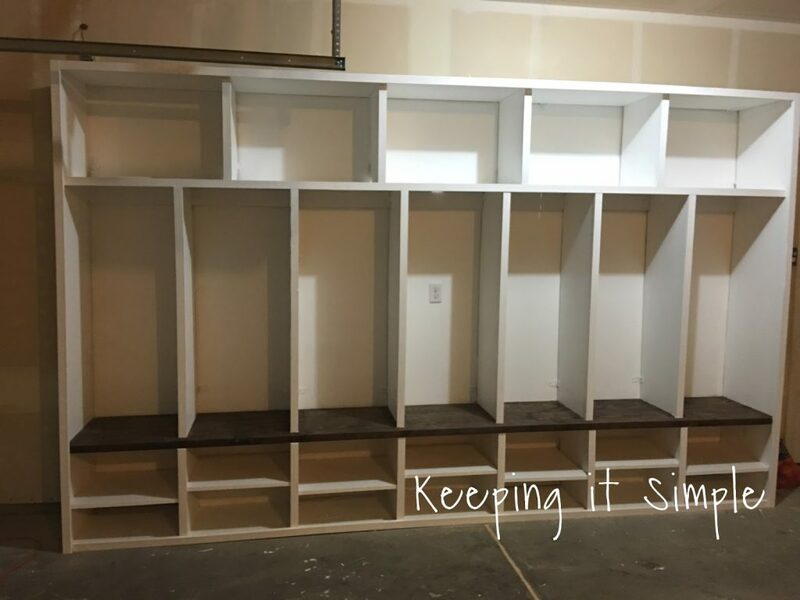 We are just completing a mudroom in our house and now I'm looking at how to set the space up. I love your design and wanted to ask if the hook locations and amount have worked well (3 in back and 2 on each side?). 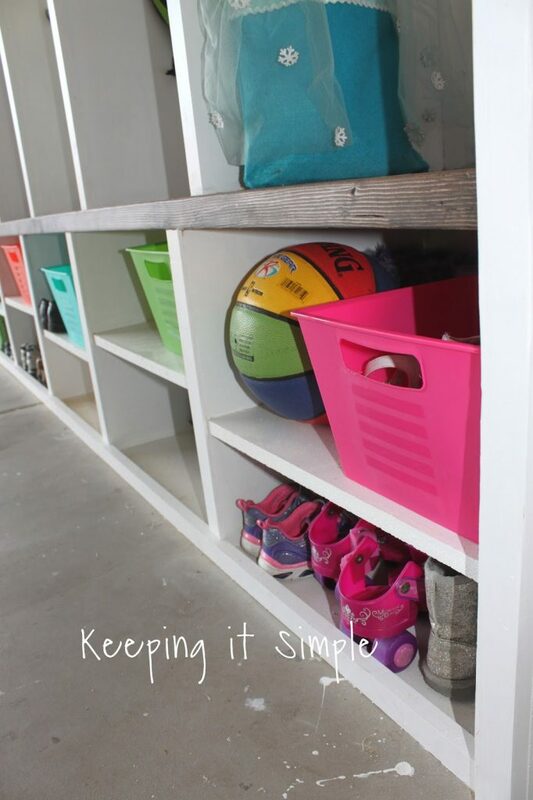 The shoe area – does that provided enough function for your family. Are rain or farm boots apart of your lives? If so, where do you store those? Thanks! I was wondering what the finished dimensions are. I have 7 people in my family & am looking into doing something very similar but wondered how wide & deep you made yours.